Freelander gets new eco engines | What Car? Land Rover Freelander buyers now have twice the choice, with two new engines available on a face-lifted model, which goes on sale at the end of September. The car now comes with either a 148bhp or a 187bhp 2.2-litre turbodiesel engine the current version comes only with a 158bhp 2.2-litre. In the entry-level model, CO2 emissions tumble two company car tax bands to 165g/km, and the new version is capable of 45.6mpg an 8% improvement over the outgoing model. Despite the 10bhp drop in power compared with the current version, torque is up, which, Land Rover claims, improves engine response and towing capabilities. Performance matches that of the current version. A six-speed manual gearbox and Stop-Start comes as standard, however an auto gearbox, without the Stop-Start technology, is a 1515 option. At 21,695, the entry-level model is also slightly cheaper than the current car. Land Rover says it has 'realigned' its prices to reflect the greater choice open to Freelander buyers. The most expensive model, the 187bhp SD4 HSE now starts at 35,510. The flagship Freelander has an average economy of 40.4mpg and emits 185g/km; 0-60mph is 8.7 seconds and top speed is 118mph. It comes with only a six-speed automatic gearbox. Both versions have a new front bumper and grille, headlight and rear light clusters and a revised interior that includes revamped instrument dials and four new styles of seats. 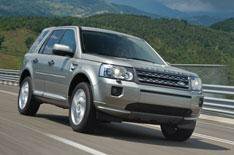 'The new Freelander 2 eD4 moves Land Rover into the hugely popular and fiercely contested two wheel-drive SUV market. 'The European market for two-wheel drive SUVs represents 23% of the segment and we intend to compete strongly here. 'A 2WD option is just one way in which we are developing our vehicles' efficiency whilst adding to the Land Rover range and expanding our appeal to a broader group of customers.